Ready for more rhubarb? This recipe comes from Donna Hay magazine and has some great flavors. Cheesecake has never been high on my dessert list, but when I saw Donna Hay's photo of the recipe, well, resistance is futile. Naturally, the rhubarb caught my eye. Wow. This rhubarb is RED. Was that possible after cooking? Turns out it was. I love it lined up that way on top of the cheesecake too, an unusual presentation. Another example of how Donna Hay pulls you in.....the photos are irresistible. Fortunately, I've rarely made anything from her magazines I didn't like. Flavored with rosewater, this rhubarb recipe is a stunner...you could make it in any shape pan you choose, depending on how you wish to serve it. I made it in a loaf pan; simpler for cutting and serving those lovely long spears of rhubarb. Lightly grease and line with baking paper a (approx) 12.5" x 3" x 3" rectangular baking pan. Place biscuits in a processor and process until coarsely chopped. Add pistachio meal and process until mixed. Add the melted butter and process to combine. Press into prepared pan and refrigerate for an hour. In a processor, combine the cream cheese, ricotta, eggs, sugar, vanilla and cardamom. Process until smooth. Pour over the refrigerated base, tap the pan a few times to remove any bubbles, and bake for 1 hour. Turn the oven off and allow the cheesecake to cool in the oven with the door closed. Refrigerate at least an hour. Turn the oven back on to 350. Place the rhubarb, the superfine sugar and rosewater in a bowl and mix. Place in a deep sided baking tray, cover with foil and bake for 15-20 minutes or until softened. Set aside to cool. 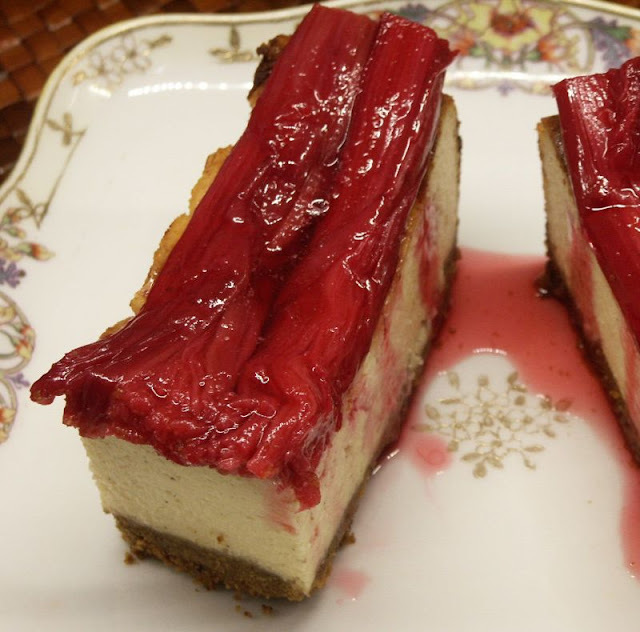 Top the cheesecake with the rhubarb, drizzle with syrup and serve. Looks like little snowballs in a dish, doesn't it? Here's one more recipe winner from Sophie Dahl. 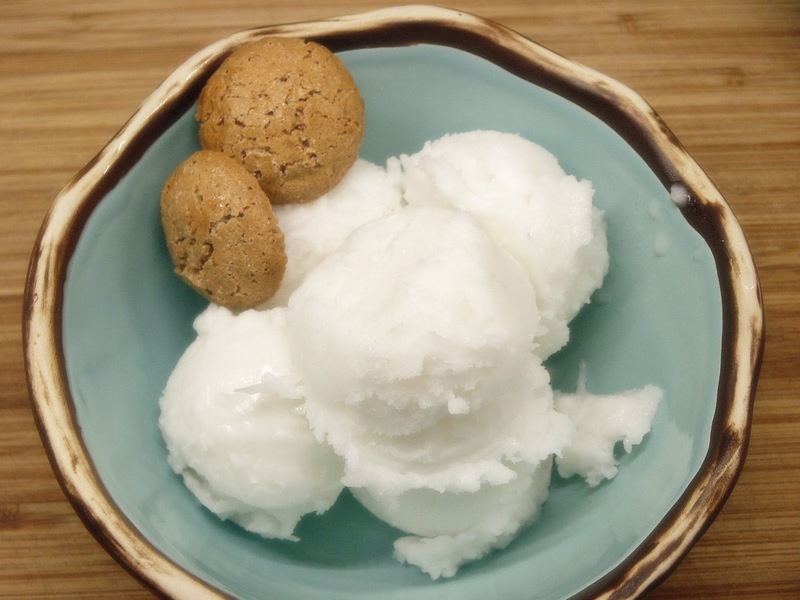 Her coconut sorbet couldn't be simpler, faster or more delicious. This recipe doesn't make a large amount, so if you're serving 4 or 5, you may want to double it. The advantage to the smaller amount is you can make it in an afternoon and serve it to your family for dinner. It chills and then freezes quickly. The lime imparts a nice tang in this sorbet and you'll love it for summer; serve it with fruit, a drizzle of chocolate sauce or with a cookie or two, but DO make it. Place the water and sugar in a pan and bring to a boil. Allow to simmer for 5 minutes. Remove from heat and stir in the coconut milk, lime juice and coconut. Allow to cool somewhat, then refrigerate until cold. This is a very small amount and will not take much time. Churn in your ice cream maker. This won't take as long as regular ice cream. Remove to a container and place in your freezer. If you don't have an ice cream maker, freeze in a plastic container for a couple hours, then put in your blender and whip, then place back in the container in the freezer for 2 hours. Scallops are on my menu frequently so I'm always searching for new ways to serve them. I loved the idea of a strawberry salsa and while most of the recipes I've found have some heat via jalapeño peppers, this one didn't. I really didn't want the strawberries to be overpowered, although there's no reason you can't add peppers if you prefer. The flavor balance of the scallops and salsa is near perfect as far as I'm concerned. The ease of cooking, the color and presentation make this a dish to delight guests, but is simple enough for two. The salsa was a snap; I'll be using it on fish frequently from now on. Mix strawberries, shallot, vinegar and minced arugula and basil in a small bowl. Add salt and pepper to taste. Adjust seasoning till you get a nice balance between sweet and sour. Refrigerate until ready to serve. Heat butter and olive oil in skillet over medium-high heat. Dry and season the scallops with salt and pepper. Add the scallops to the skillet and cook, not turning, for about 3 minutes, or until you see the white/cooked portion of the scallop rise about halfway up the side. Flip scallops and cook for another minute or two, until cooked through. Remove scallops to serving plate. 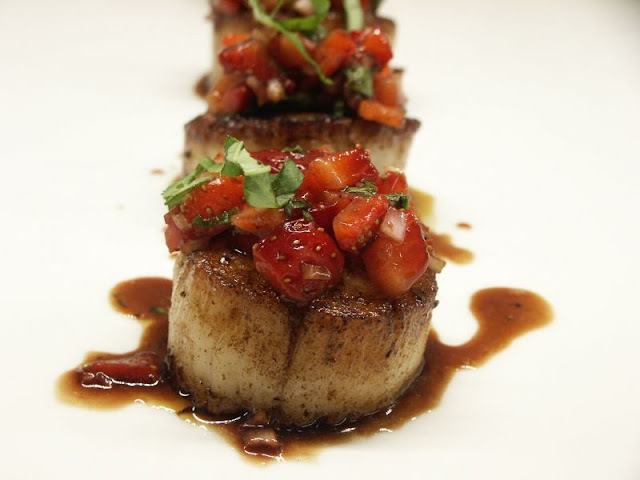 Top each scallop with a spoonful of the salsa and garnish with ribbons of basil and arugula. Is the photo below worth a thousand words or what? I don't make a lot of yeast bread and rolls anymore but I must say, these were even better than the dulce de leche brioche I made a while back and I didn't think anything could beat those. My daughter's hands down favorite breakfast has always been my homemade coconut bread, toasted...the recipe was originally in the Ft. Lauderdale newspaper back in the 70's....I recently posted the recipe HERE, but that may change after her visit this weekend. 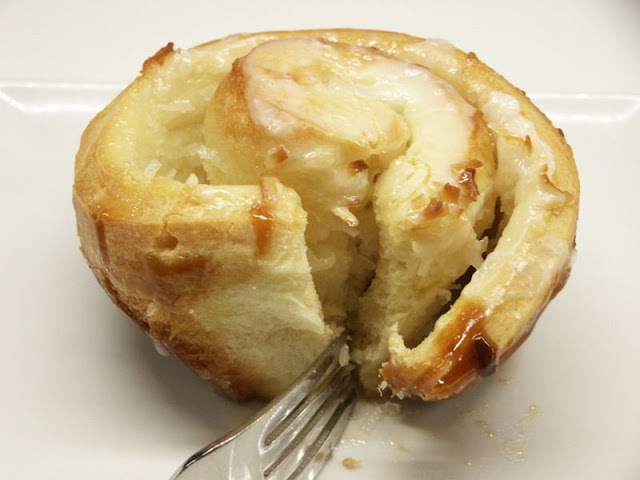 When I took one look at this recipe, I knew I had to make these scrumptious (understatement) rolls for her to try. It takes some time, but there's nothing difficult about it. It's just the double-rising that takes time. Rather than make them in a single pan as instructed below, I made individual rolls in my oversized muffin pan, hence the neat shape. The entire recipe made only 6 in the large muffin pan. Up to you. No... I don't want to think about the calories in just one of these. Cut them in half. Or make them smaller if you'll feel better about it. Unfortunately, you'll just end up eating more. The rolls: Warm the milk slightly and add the yeast. Set aside. Cream together the sugar, salt, and butter on medium-high speed in an electric mixer with a paddle attachment. Beat in the egg until smooth. Alternately, add the flour and milk/yeast mixture. Mix on low speed until the dough forms a ball. Switch to the dough hook and increase the speed to medium, mixing for approximately 10 minutes (or knead by hand for 12 to 15 minutes), or until the dough is silky and supple, tacky but not sticky. Lightly oil a large bowl and transfer the dough to the bowl, rolling it around to coat it with oil. Cover the bowl with plastic wrap. Allow to rise at room temperature for about 2 hours. Meanwhile, make the glaze. In the bowl of an electric mixer, combine sugar, salt, and butter. Cream together for 2 minutes on high speed with the paddle attachment. Add the honey. Continue to cream for about 5 minutes, or until light and fluffy. 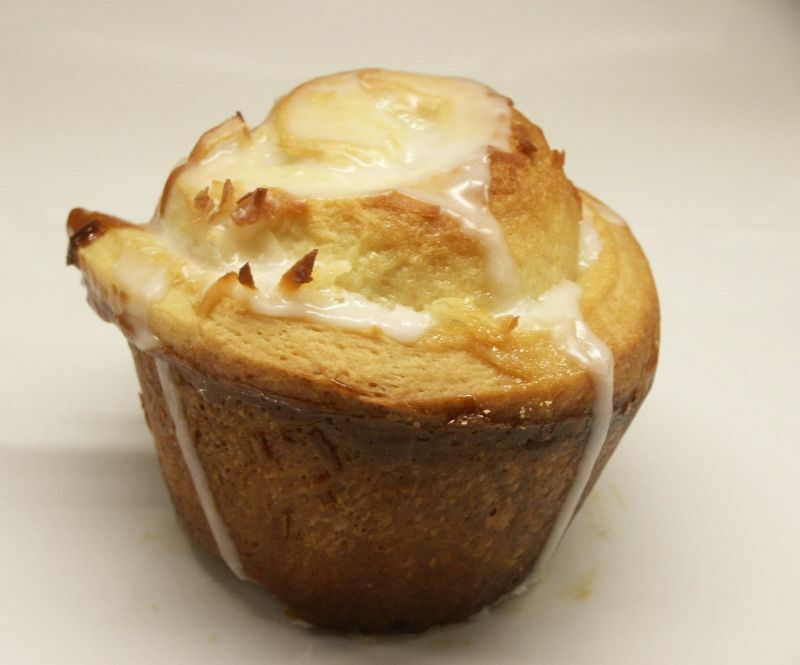 When ready, pour half of the glaze into the bottom of your baking pan or divide half evenly among your muffin tins. Mist your counter with spray oil and transfer the dough to the counter. Roll out the dough with a rolling pin, lightly dusting the top with flour to keep it from sticking to the pin, into a rectangle about 14 inches wide by 12 inches long for larger rolls, or 18 inches wide by 9 inches long for smaller rolls. Spread the other half of the glaze on the dough and sprinkle the coconut over the surface of the dough. Roll the dough up into a cigar-shaped log (starting at the long end). With the seam side down, cut the dough into 8 to 12 pieces each about 1 3/4 inches thick for larger rolls, or 12 to 16 pieces each 1 1/4 inch thick for smaller rolls. In your glazed pan (or muffin tin/tins), lay the pieces of dough on top of the glaze, spiral side up, spacing them about 1/2 inch apart. Mist the dough with spray oil and cover loosely with plastic wrap. let rise for 75 to 90 minutes, or until the pieces have grown into one another and nearly doubled. Preheat the oven to 350 with a rack on the lowest shelf. Bake them for 20-30 minutes, or until golden brown. Cool the rolls in the pan for 5 to 10 minutes. wait at least 20 minutes before serving. Mix the icing sugar with milk and pour the glaze over the rolls. Cookies for breakfast? Well, yes! 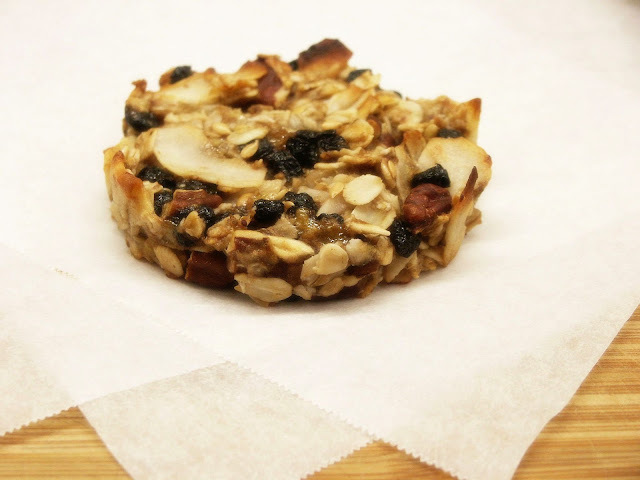 These are somewhat like granola bars except better, easier to make, the answer to a hurried morning as well as mid-afternoon treats. Love that I've found yet another way to use ripe bananas too; I do get tired of banana breads. As I read through the ingredients my first thought was: these are all things I like on my oatmeal; my second thoughts? Only one bowl to clean, high in fiber, a healthy fat, yet a little bit sweet. This is a no-brainer. I was introduced to dried blueberries many years ago at American Spoon, a company I watched from their start with a little storefront in Petoskey, Michigan. When you got anywhere near the place, amazing aromas poured out their front door. They have a fabulous mail order business now, and that little store is still there. You'll find these tiny blueberry gems are loaded with flavor and are perfect in this recipe. This makes about 15 cookies, which is more than I needed, so I froze some. Will be interested to see how that works. Mix oats, coconut, golden flaxmeal, salt, pecans, and blueberries. Stir in bananas, oil, agave nectar and vanilla until well combined. Press 2 tablespoons of mixture into a 2 1/2-inch round cookie cutter onto a parchment-lined baking sheet. Continue with remaining mixture. Bake at 350° for 25 minutes or until fragrant and golden. Cool on pan. 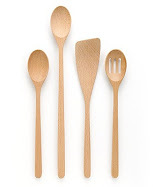 Welcome to the first posting of Ina Garten Fridays! A group of us are posting an Ina recipe the first Friday of every month. It ought to be fun because Ina is one of my favorite chefs. 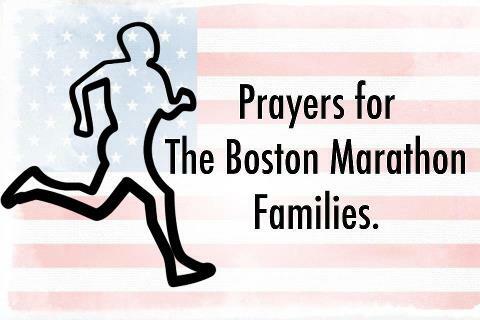 Thank you, Alyce, for organizing this. You'll find a list of those participating at the end of each of our "First Friday" posts. If you like The Barefoot Contessa as much as we do, it'll be fun to check in with each of us to see what we've chosen to represent each category. It can be an Ina recipe, or our take on an Ina recipe. April has been designated appetizers and rather than thumbing through one of Ina's cookbooks, I went to a file I keep on my desktop where I store Ina recipes I've seen on The Food Network I want to try. There it was: Crab Strudel. I used to make a lobster strudel that everyone loved so wanted to compare the recipes. Nothing alike, except for the phyllo. My old recipe had cheese with the lobster and Ina's recipe is curry-based. Hers is actually much lighter (in spite of the butter in the phyllo layers) and they went like hot cakes when I served them. I noticed in the reviews online that many people used Old Bay Seasoning instead of curry...no reason why you couldn't do that if you're not a curry fan. And some others even added Parmesan cheese as well as using Panko instead of regular bread crumbs. Also, you could use lobster, shrimp, scallops OR crab in this recipe. Very versatile. Heat 2 tablespoons butter in a medium saute pan, add the scallions and garlic and cook over medium-low heat until the scallions are soft, approximately 5 minutes. Add the curry powder and stir. Shred the crabmeat into a bowl and mix with the parsley, lime juice, salt, to taste, and pepper. Add the crabmeat to the scallion mixture. Melt 10 tablespoons of butter in a small pan and set aside. Unfold 1 sheet of the phyllo dough. Brush the sheet with melted butter and sprinkle with bread crumbs. Repeat the process by laying a second sheet of phyllo dough over the first sheet, brush it with melted butter and sprinkle with bread crumbs until 5 sheets have been used. Spoon a 1-inch wide row of the crab mixture along 1 edge of the phyllo dough. Roll it up. Brush the top with butter and set aside. Repeat the entire process using the all the phyllo dough and crab filling. Cover a sheet pan with parchment paper. 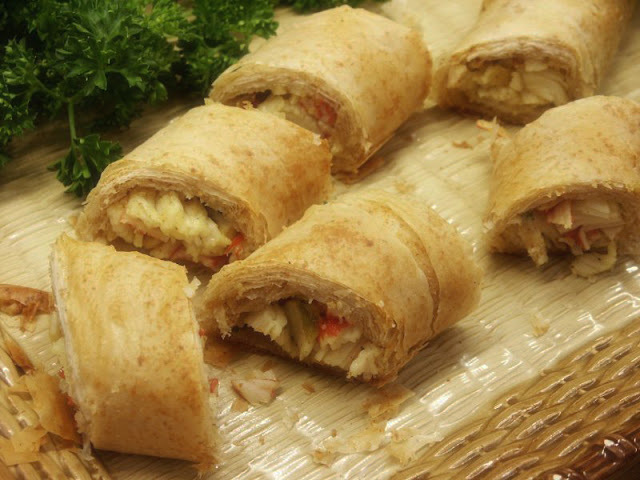 Score the crab strudel diagonally into 1 1/2-inch pieces and bake for 12 minutes, or until the top is lightly brown. Slice and serve.